Hello Friends! Thanks so much for stopping by and visiting my blog, Stock Picks Bob's Advice. As always, please remember that I am an amateur investor and you need to consult with your professional investment advisors prior to making any investment decisions based on information on this website. I missed last weekend with my post, so I have fallen back another week in my trailing 52 week review. I am now up to about 60 weeks out. Anyhow, what I like to do on these weekend posts, is to examine how the stocks listed on this blog have performed since posting. Sort of a quality check you could say. Again, this review assumes a buy and hold strategy. If you have been following my blog for awhile you will realize that I do not use a buy and hold approach. I very much like to sell my losing stocks quickly, unloading them if I have an 8% loss, and sell my winning stocks slowly with 1/4 position sales at targeted gains. On June 1, 2004, I posted SRA International (SRX) on Stock Picks at a price of $41.80. SRX had a 2:1 split on 5/31/05, and thus my "pick price" was effectively $20.90. SRX closed at $37.20 on 7/29/05, for a gain of $16.30 or 78.0%. SRX is a stock that I do own in my trading portfolio, the only stock that I have a position of the three stocks that I am reviewing this week. SRX is actually going to report earnings tomorrow, but since I am writing today, unfortunately I am stuck with the latest quarter which was the 3rd quarter 2005 fiscal report which was reported on May 2, 2005. During the quarter which ended March 31, 2005, revenue grew 41% to $226 million from $160 million the same period in 2004. Net income climbed 44% from $10.2 million to $14.7 million, and diluted earnings per share increased 41% from $.37/share to $.52/share in the latest quarter. In addition they raised guidance for fiscal 2005. All-in-all, everything that one would want to read from a company! On June 2, 2004, I posted Micronetics (NOIZ) on Stock Picks at a price of $9.33. NOIZ closed on 7/29/05 at $8.39 for a loss of $(.94)/share or (10.1)%. 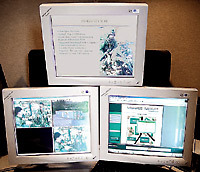 On July 1, 2005, NOIZ reported 4th quarter 2005 results. Revenue came in at $3.7 million, down (6.0)% from $3.95 million the prior year. Net income was also down slightly at $476,957 or $.11/share, from $480,275 or $.11/share the prior year. Finally, on June 3, 2004, I posted Bebe Stores (BEBE) on Stock Picks at a price of $21.17. BEBE split 3:2 on 12/30/04, and 3:2 again on 6/6/05 giving us an effective stock pick price of $9.41. BEBE 7/29/05 at $28.46 for a gain of $19.05 or 202.4%. This might be a good point to remind everyone that past performance is NEVER a guarantee of future performance. But that still was a pretty phenomenal performance for that stock pick and unfortunately, that was the one that I never bought any shares! On April 21, 2005, BEBE announced 3rd quarter 2005 results. Net sales for the third quarter 2005 ended April 2, 2005, came in at $116.9 million, up 39.7% from $83.6 million reported in the third quarter of 2004. On top of this, BEBE reported that "same store sales" for the quarter came in at 28.5% which is a phenomenal result! Net earnings for the quarter climbed 103.7% to $11.1 million, compared to $5.5 million last year. Diluted earnings per share were up 100% to $.18, vs $.09/share last year. This was a great report and the stock price has performed in line with this! So how did I do for the week of May 31, 2005, in "picking" stocks? Well pretty darn good if I may say so myself :). I had three stocks listed and two made great gains and one sold off. With the huge gain in BEBE, the three stocks ended up with an average performance of a gain of 90.1% since posting last year. AGAIN, let me remind you that past performance is not a guarantee of future performance, but THAT was a pretty good week to review! Thanks again for stopping by and visiting. If you have any comments or questions, please feel free to leave them right here on the blog or email me at bobsadviceforstocks@lycos.com. Hello Friends! Thanks so much for stopping by and visiting my blog, Stock Picks Bob's Advice. As always, please remember that I am an amateur investor and that prior to making any investment decisions based on information on this website you should consult with professional investment advisors. I was looking through the list of top % gainers on the NASDAQ today, and came across Middleby Corporation (MIDD), a mid cap stock with an interesting record! I do not own any shares nor do I own any options on this company. 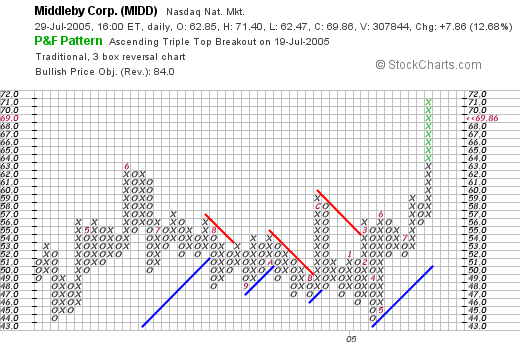 MIDD closed today at $69.86, up $7.86 or 12.86% on the day. 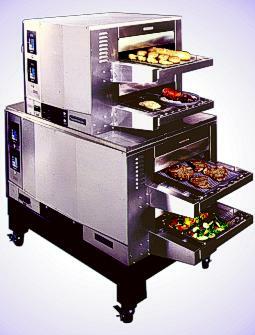 According to the Yahoo "Profile" on MIDD, the company "...through its subsidiaries, engages in the design, manufacture, and sale of commercial and institutional foodservice equipment." Looking at the Morningstar.com "5-Yr Restated" financials, we can see a bit of an erratic growth in revenue, dropping from $129.6 million in 2000 to $103.6 million in 2001. However, since 2001, the revenue has grown nicely to $283.5 million in the trailing twelve months (TTM). Morningstar also shows a similar drop in earnings between 2000 at $.35/share to $.18/share in 2001. Since that year, earnings have also steadily been rising to the $2.61 in the trailing twelve months. $.25 in 2003, and $.40 in the TTM. Free cash flow has remained positive, with $18 million reported in 2002, but has dropped to $11 million in the TTM. The balance sheet shows an excess of current assets over current liabilities at $2.6 million in cash and $86.8 million in other current assets balanced against $68.2 million in current liabilities and $140.4 million in long-term debt. Reviewing "Key Statistics" from Yahoo, we find that the market cap is a small mid-cap stock at $541.97 million. The trailing p/e is moderate at 27.10, and the forward p/e (fye 01-Jan-07) is even nicer at 16.79. Thus, due to the fast growth, the PEG (5 yr expected) comes in under 1.0 at 0.92. Looking at the Price/Sales ratio, relative to its industrial group of "Diversified Machinery", we can see, according to my Fidelity brokerage research, that this company is valued midway between other members of this group. Topping out the group in valuation is Roper Industries (ROP) with a Price/Sales of 2.8, next is Pall (PLL) at 2.1, and Illinois Tool Works (ITW) at 2.0. Middleby (MIDD) comes at 1.7, followed by Ingersoll-Rand (IR) at 1.3 and Eaton (ETN) at 0.9. Reviewing the rest of the Yahoo "Key Statistics" information, we find that the company has only 7.76 million shares outstanding with 4.06 million of them that float. There are quite a few shares out short, 649,000 as of 7/12/05, representing 14% of the float or 9.9 trading days of volume. The sharp rise today might be due to some "squeezing" of the shorts in the face of good earnings. But that is of course just a guess :). Yahoo does not show a dividend, while Morningstar shows a $.40/share dividend this past year. No stock splits are reported on Yahoo. We can see that the stock was pretty much trading sideways and declining slowly from a high of $63 in June, 2004, to the low of $44 in April, 2005. Since April, the stock has been trading quite strongly to the upside. So what do I think? Well this is certainly a different sort of stock! Not a biotech, not even high tech at all. Just cooking equipment (I really should never say "just"!). Reviewing, the stock moved strongly higher today on a very strong earnings report. The last 4 years have been solid with just a small glitch in performance between 2000 and 2001. Although not growing, free cash is positive. And the balance sheet is solid if not overwhelming. Valuation looks good with a p/e in the low 20's, a PEG under 1.0, and a Price/Sales that is the middle of its industrial group. 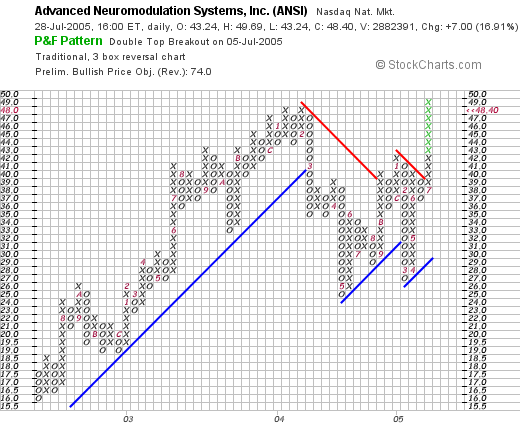 I was looking through the list of top % gainers on the NASDAQ today and came across an old pick of mine, Advanced Neuromodulation Systems (ANSI) which closed today at $48.40, up $7.00 or 16.91% on the day. I first posted ANSI on Stock Picks on 5/19/04 when it was trading at $33.03. Thus, in the little more than a year that I have looked at ANSI, this stock has appreciated by $15.37 or 46.5%. According to the Yahoo "Profile" on ANSI, the company "...engages in the design, development, manufacture, and marketing of implantable neuromodulation devices, which are used to manage chronic intractable pain and other disorders of the central nervous system through the delivery of electrical current or drugs directly to targeted nerve fibers." I do not own any shares or options in ANSI. What drove the stock higher today was the release prior to the opening of trading of the 2nd quarter 2005 earnings results. Revenue for the quarter ended June 30, 2005, grew 26.9% to a record $38.7 million from $30.5 million in the same quarter last year. Net income for the quarter jumped 17.6% to $5.1 million or $.25/diluted share, up from $4.3 million or $.21/diluted share for the same quarter in 2004. Taking a look at the "5-Yr Restated" financials on Morningstar.com, we can see the beautiful progression of the purple bars showing the revenue growth from $31.8 million in 2000 to $126.4 million in the trailing twelve months (TTM). Free cash flow has also been growing steadily from $1 million in 2002 to $18 million in the TTM. The balance sheet is impeccable with $180.7 million in cash alone, enough to cover both the $40.3 million in current liabilities and the $6.7 million in long-term debt almost four times over! In addition, ANSI is shown by Morningstar to have an additional $54.8 million in other current assets. Looking at Yahoo "Key Statistics" on ANSI, we can see that the Market Cap is a mid-cap-sized $959.92 million. The trailing P/E is cheap at 14.06 (this must include some one-time income as the forward P/E is steeper at 40.00). Insofar as the Price/Sales figure is concerned, ANSI is relatively expensive in its group of "Medical Instruments/Supplies". Topping off the list is Alcon (ACL) at 8.6 P/S, however ANSI is next at 6.5, Guidant (GDT) is next at 5.9, Stryker (SYK) at 4.8, Boston Scientific (BSX) at 3.8, and Baxter (BAX) at 2.5. Other "Key Statistics" show that ANSI has 19.83 million shares outstanding with 19.59 million of them that float. Currently, there are 3.22 million shares out short representing 16.50% of the float as of 6/10/05, or 9.2 trading days of volume. This is a bit of a significant short interest outstanding, and some of the shares purchased might be due to a "squeeze" of short-sellers. Yahoo reports no cash dividend and the last stock split was a 3:2 split in July, 2003. We can see that the stock was trading strongly higher between July, 2002, and February, 2004, when the stock moved from $16 to the $48 level. The stock then sold off and consolidated between the $26 to $48 level, before breaking through resistance this month at $39. The graph looks strong yet not overvalued to me. So let's review: the stock has traded strongly higher since posting here last year. The stock made a nice move on a strong earnings report. The earnings and revenue have grown nicely the past five years. Free cash flow is positive and the balance sheet is perfect. Even the graph is reassuring. Of course I have 25 positions already in my portfolio so I am not in the market to buy anything. However, this stock sure is interesting! If you have any questions or comments, please feel free to email me at bobsadviceforstocks@lycos.com. I just got finished posting my Mentor (MNT) post, and now my American Healthways (AMHC) has also hit a sale point. A few moments ago I sold 42 shares of my AMHC (out of a 170 share position) at $45.12/share. These shares were initially acquired 6/18/04 at a cost basis of $23.53, so I had a gain of $21.59 or 91.8%. This was my third sale, so my targeted gain was at 90%! I continue to work at paying down my margin, and even with these small sales, have just passed 50% equity. Thanks so much for stopping by! If you have any comments or questions, please feel free to leave them right here on the blog or email me at bobsadviceforstocks@lycos.com. Hello Friends! Thanks so much for stopping by and visiting my blog, Stock Picks Bob's Advice. As always, please remember that I am an amateur investor, so please consult with your professional investment advisors prior to using any information on this website to make any investment decisions. As you probably know if you are a regular reader of this blog, I have an actual "Trading Account" that I make actual investments and real trades based on strategy discussed on this blog and using investments also discussed here. I have my own set of trading rules that on first glance appear rather rigid, and actually on reinspection confirm that first impression! In a nutshell, I try to sell my losing stocks completely quickly, and sell my gaining stocks partially and slowly. My current goals for 1/4 position sales are at 30, 60, 90, 120, 180, 240...% gains. A few moments ago, I sold 50 shares of my 200 shares of Mentor Corporation (MNT), representing 1/4 of my position, at the first targeted price gain of 30%. The transaction price was a sale at $45.20 this morning. I purchased my 200 shares of Mentor at $34.37 on 2/3/05, and thus, I had a gain of $10.83 or 31.5% on these shares. Since I am up to 25 positions, I shall be applying the proceeds to my considerable margin balance. If I were not in margin, I would be adding to my "cash" levels. If I were under 25 positions, my targeted size of my portfolio, I would be using the proceeds to add a new position, something I have done in the past, trying to "listen" to my portfolio telling me when to be moving into additional positions or moving out of equities into cash on sales of stocks on bad news. (or poor price performance). Anyhow, I hope this discussion continues to be useful. I look forward to continuing to pay down margin while the stocks continue to appreciate in preparation for any eventual correction. I have recently received a lot of email inquiries about "how" I pick a stock, and "why" and things like that. Let me try, once again and go over my thinking using a stock that seems to meet the requirements today. My first stop in the process of finding a stock to discuss is to review the list of top % gainers. In this particular case, I found a stock to discuss on the list of top % gainers on the NYSE today. Anteon International Corp (ANT) closed today at $47.86, up $2.06 or 4.50%, enough to make the top % gainers list. I do NOT own any shares of ANT nor do I have any options on this company. What drove the stock higher today was the announcement of 2nd quarter 2005 results before the opening of trading. ANT reported revenues for the second quarter ended June 30, 2005, of $368.6 million, a 21.2% increase from $304.2 million last year same quarter. Net income climbed 36.2% to $20.0 million vs. $14.7 million in the same period last year. Fully diluted earnings per share came in at $.53/share vs. $.39 in the prior year, a gain of 35.9%. In addition, Anteon's management raised full year 2005 revenue guidance to between $1.465 and $1.49 billion, and raised earnings expectations to $2.01 or higher. A great earnings report combined with raised guidance is almost always a sure sign of success! O.K. so what does Anteon do anyway? This company is a military contractor and receives contracts from the Air Force and Navy among other branches of the military. According to the Yahoo "Profile" on ANT, Anteon "...provides information technology solutions, and systems engineering and integration services to government customers. It designs, integrates, maintains, and upgrades systems for national defense, intelligence, emergency response, and other government missions." 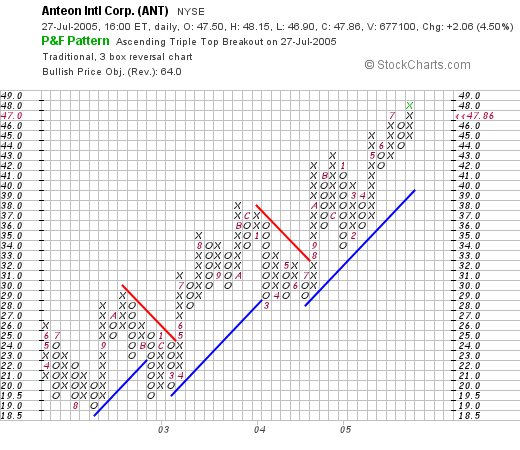 At this point we know that Anteon had a great quarter and made a nice move today. But what about longer-term? It is this historic record of revenue and earnings growth that suggests a possible persistence of this performance which I believe is the basis for stock price appreciation. Anyhow, for this information I like to turn to Morningstar.com, and the particular information I like to use is on the "5-Yr Restated" financials page. Here we can see that the revenue stream starts in 2001 at $.7 billion and has been steadily growing each year to the current $1.33 billion in the trailing twelve months (TTM). The earnings record is not as long but shows growth from $.98 in 2003 to $1.78 in the TTM. Free cash flow which was a negative $(5) million in 2002, has improved substantially to $65 million in the TTM. Looking at the balance sheet as presented on Morningstar.com, we can see that the company has $35.1 million in cash and $314.6 million in other current assets, plenty to cover both the $180.7 million in current liabilities and the $176.1 million in long-term liabilities. What about "valuation"? Looking at Yahoo "Key Statistics" on ANT, we can see that this is a mid cap stock with a market capitalization of $1.75 billion. The trailing p/e is moderate at 26.90, with a forward p/e of 21.27 (fye 31-Dec-06). The PEG is reasonable at 1.37. Insofar as the Price/Sales ratio is concerned, as I have mentioned elsewhere, Paul Sturm has discussed the Price/Sales ratio on Smart Money, and suggests it is the valuation relative to other members of the particular industrial group that determines whether the stock has a reasonable, cheap, or expensive valuation in regards to this parameter. Using my Fidelity brokerage account for this data, I found that ANT is in the "Information Technology Services" group. The top Price/Sales value is SRA Int'l (SRX) at 2.4, followed by Affiliated Computer Services (ACS) at 1.5, Anteon (ANT) at 1.3, Computer Sciences Corp (CSFC) at 0.6, and at the bottom of the heap is Electronic Data Services (EDS) with a Price/Sales ratio of only 0.5. Thus, ANT appears to be in the middle of this particular group. Other statistics from Yahoo show that there are 36.51 million shares outstanding with 32.17 million of them that float. Of these there were 2.17 million shares out short as of 5/10/05, representing 3.6 trading days or 6.10% of the float. This appears to be mildly significant (slightly over my "3-day rule"). No cash and no stock dividends are reported on Yahoo. We can see that this stock really has been trading steadily higher from August, 2002, when it was at $19, to its current level of $47.96. This graph looks strong yet not overvalued to me. So what do I think? Well, I am not trying to politically correct or incorrect here, but Anteon does seem to fit the bill. If one subscribes to this type of security spending as cyclical, we could be late in the cycle. However, if this is going to be a persistent expenditure, this company could continue to grow for many years. In summary, the stock moved nicely today on a great earnings report and also raised guidance. The past several years have been strong both in regards to revenue and earnings growth. The company is free cash flow "positive" and the balance sheet looks nice. Valuation is reasonable if not cheap and the chart looks solid. These are the things that I like to use on this blog! Of course, I am at 25 positions now, and am not in any type of position to be adding a new stock. However, if I were....you know how badly that nickel always burns a hole in my pocket! LOL....Please email me at bobsadviceforstocks@lycos.com if you have any questions or comments. 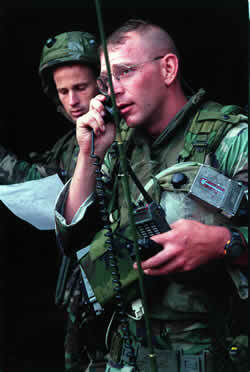 A Reader Writes: "How did you come across ISRG back in April of 2004?" 1. How did you come across ISRG back in April of 2004? It was nothing special as you said before you did a deeper analysis, but how did you initially come across this stock? Did someone mention it, did you read about it? 2. How does one spot companies such as these that are young, offer promising new products, but have not yet been discovered fully by analysts or mutual fund companies? 3. I could see that this stock was up and down over the past five years, but if someone had spotted them in 2001, they could have gotten in at a very low price, and then stuck for the ride. Again, how does one screen for such companies? First of all, thank you Art for visiting and taking the time to write! I believe it is the discussion on this blog that makes it all worthwhile and maybe we all can learn a little from these inquiries. First of all, I am not as smart as I look :). For I did not buy any ISRG stock for myself. I bought about 20 shares for my son in one of his accounts and he did well with it. My stock club also purchased some ISRG shares on my suggestion. However, you will not find any shares in my own trading portfolio. 1) How did I come across ISRG? answer: I found ISRG like I find all of my stocks. I start with the top % gainers each day (when I do look), and then look at the latest quarterly report screening for both positive earnings and revenue growth, followed by a Morningstar.com examination of the "5-Yr Restated" financials--I am looking for a fairly steady five year growth in earnings and revenue, positive free cash flow, a reasonable balance sheet with assets greater than liabilities, at a least current assets exceeding current liabilities. Finally, I take a look at "Key Statistics" on Yahoo for more detailed background information, and a "point & figure" chart from Stockcharts.com. By the way, I posted Intuitive Surgical (ISRG) on Stock Picks on April 30, 2004 when it was trading at $16.35. ISRG closed today (7/27/05) a little more than a year later at $64.82, up $13.52 on the day (!) or 26.35% just today on the price. Since my post, the stock has appreciated $48.47 or 296.4%. 2) How does one spot companies such as these that are young, offering promising new products, but have not yet been discovered by analysts or mutual fund companies? answer: I guess you could do the same thing that I do :). I don't think that I can discover anything before everyone else, but maybe we can find some stocks that will appreciate earlier than some other people. You have to realize that I literally have hundreds of stocks listed on this blog, and ISRG has happened to be a top performer. Others however, have panned out. So take my stock pick on that particular day with a grain of salt. In my view, I am looking for stocks that show a consistency in earnings and revenue growth, and have something positive happening (like an earnings report) that causes them to make a large positive move that day. 3. This last question is a repeat: "How does one screen for such companies?". See the prior answer. There is NO magic to successful investing. Just hard work, discipline, and observation of details. Try to build a portfolio of companies growing steadily, with good finances. When you make a mistake and the stock declines, sell it quickly. When it works out, do the opposite, sell it slowly. Good-luck and again thanks for stopping by. I wish I were more brilliant or eloquent, but there is nothing mysterious about what I do. One investor once complained to me that all I was doing was "due diligence." Maybe we all need to do that a bit more thoroughly :). A Reader Writes: "It seems like the MACD (12,26) would be a good measure for that." Hello Friends! Thanks so much for stopping by and visiting my blog, Stock Picks Bob's Advice. As ALWAYS, please remember that I am an amateur investor, so PLEASE consult with your professional investment advisors prior to making any investing decisions based on information on this website! I have been getting a few more letters lately, and I enjoy sharing them with you! If you write, please be aware that I shall likely be posting your questions and comments, but shall keep from identifying you with your last name. sell point on 3 of my investments. Thanks to you! Thanks again for this wonderful service. to you in the event you need any help. Harish, thank you for your kind words. Remember that you are on your own when investing and please consider consulting with a professional advisor prior to using my amateur approach. In fact, I need to make a confession to you right away. Even though I write a lot, and have looked at LOADS of stocks, I really, truly am an amateur. So when you wrote about the MACD (12, 26), you had me stumped. I actually had to go and GOOGLE this to get the definition. I am aware of 50 day and 200 day moving averages, but was not familiar with the MACD (12,26)! The most popular formula for the "standard" MACD is the difference between a security's 26-day and 12-day exponential moving averages. This is the formula that is used in many popular technical analysis programs, including SharpCharts, and quoted in most technical analysis books on the subject. Appel and others have since tinkered with these original settings to come up with a MACD that is better suited for faster or slower securities. Using shorter moving averages will produce a quicker, more responsive indicator, while using longer moving averages will produce a slower indicator, less prone to whipsaws. For our purposes in this article, the traditional 12/26 MACD will be used for explanations. Later in the indicator series, we will address the use of different moving averages in calculating MACD. Of the two moving averages that make up MACD, the 12-day EMA is the faster and the 26-day EMA is the slower. Closing prices are used to form the moving averages. Usually, a 9-day EMA of MACD is plotted along side to act as a trigger line. A bullish crossover occurs when MACD moves above its 9-day EMA and a bearish crossover occurs when MACD moves below its 9-day EMA. 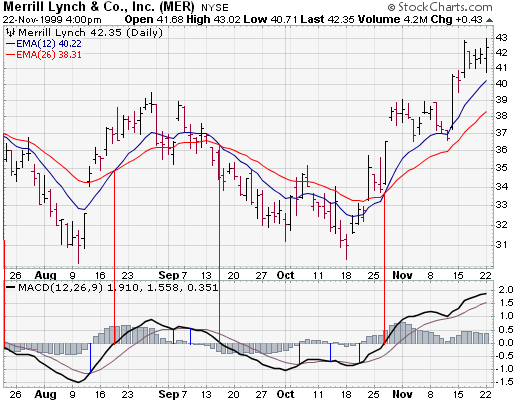 The Merrill Lynch chart below shows the 12-day EMA (thin blue line) with the 26-day EMA (thin red line) overlaid the price plot. MACD appears in the box below as the thick black line and its 9-day EMA is the thin blue line. The histogram represents the difference between MACD and its 9-day EMA. The histogram is positive when MACD is above its 9-day EMA and negative when MACD is below its 9-day EMA. You can see the crossing over of the 26 day EMA (red) by the 12 day EMA (blue). These do seem to precede movements in the stock price! I shall see if I can comment on this occasionally in the blog! Generally, I believe what we are discussing is the same thing from two different perspectives. My first point of reference in selecting a stock to review is the top % gainers list. These large swings most likely will result in the crossing of the short term moving average with the long-term line....if the move is big enough :). I think that your approach is excellent, but probably not necessary for a successful investment program. In any case, I am very appreciative for your insight. You have helped educate me and I hope thus my readers! Do I need a software engineer? The place is a bit of a mess, but I am ok with things just as they are for now! One cannot expect an amateur to have a professional website can one? A Reader Writes: "How should I start?" Hello Friends! Thanks so much for stopping by and visiting my blog, Stock Picks Bob's Advice. As always, please remember that I am an amateur investor, so please consult with your professional investment advisors prior to making any investment decisions based on information on this website. And even to answers to questions in the Email! I am a fulltime mom, and now I feel the need to make some extra income to help my husband to support our own family and his brother's family as well. I have only $500 in my brokerage account. It seems to me there are not many opportunities for such little money. I am targeting on the small cap stocks whose prices are under $5, and I would like to do swing trades. But so far I haven't been able to get into any position. Do you have any advice for me on how I should start? Thank you so very much for your time and help!! Thank you for writing Amy! Please really take seriously the fact that I am an amateur investor. I am not qualified to advise you individually about your particular situation and you should consult with your professional investment advisor. I would like to share with you my own experience in investing. Years ago, literally about 25-30 years ago, when I first started investing, I would invest small dollar amounts into my Merrill Lynch "Sharebuilder Account". I am not sure whether Merrill still has that option or not, but I would pick a stock and buy maybe $75 or $125 worth of stock even if it were just a share or two. I am aware, however, of the "ShareBuilder" online brokerage. I do not have ANY financial interest in this site, nor do I receive any money from this or any brokerage account. Perhaps someday, if I ever get famous :) I shall have ads here! But not today. Anyhow, ShareBuilder does allow small investments. For anybody starting out with a small amount, it is always wise to do the usual responsible things, like pay down high interest credit cards, develop a 90 day cash reserve, etc. However, if you are interested in equities and mutual funds don't do anything for you, then maybe buying some shares isn't a bad idea. Personally, I find that your particular strategy, while it may turn out great for you, is high risk. And with the small amount of funds that you have, I would rather you start with just a few shares of a quality stock rather than a lot of shares of a small priced stock. As William O'Neill likes to point out, most of the stocks under $5 are going to be of poorer quality than the more expensive shares. These tend to be of greater risk, and even though you might think you could make some money this way, the possibility of losing it is also greater. That being said, I would rather see you purchase $300 of one stock and $200 of a second stock and then regularly add some cash to these two positions until you reach your initial $ goal for a position. For instance, you might wish to accumulate a $1,000 position. And if you were interested in adding $100/month to the account, you could buy $50/month of each stock. One is likely to hit your goal first...then you could start on a third stock, etc. until you hit your initial goal. Try not to worry about how many shares you will be owning. This isn't a good way to make any income in the short run, but in the long run, you can acquire a significant portfolio even if you start small. Good luck investing! Let me know what you decide to go and I shall share it with our readers (if you don't mind!). A Reader Writes: "Here is my first pick: TPX"
Hello Friends! Thanks so much for stopping by and visiting my blog, Stock Picks Bob's Advice. As always, please remember that I am an amateur investor, so please consult with your professional investment advisors prior to making any decisions based on information on this website. I know it may be a bit conservative, but it is a stock that I have had my eye on & I noticed that Morningstar increased the rating to 5. I went through the criteria you set out & TPX seems to meet those. Stan, first of all thank you for letting me know about what you were thinking about investing. Of course, I CANNOT determine whether this would be a good investment for you or not and really mean it when I tell you that I am an amateur investor, so please consult with a professional investment advisor. However, a few words on TPX and whether it does actually fit my "rules". One of the key things to my investing strategy, is that a stock must fit the rules on the day that I choose to purchase it. It is not enough that it fit the rules in the recent past. What do I mean by that? Well, my FIRST rule and starting point is that a stock is on the list of top % gainers that day. Not a week or so ago. So let's take a look at Tempur-Pedic (TPX). 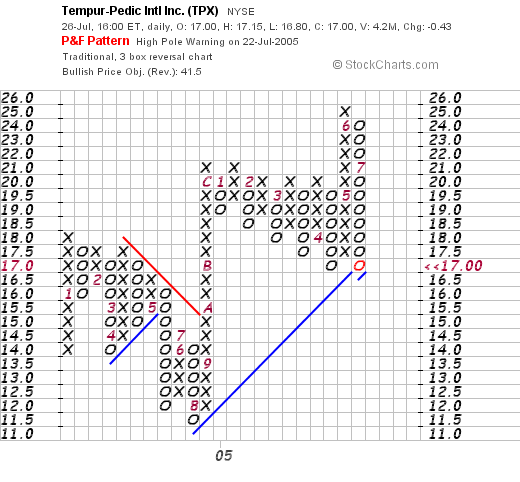 First of all, I posted Tempur-Pedic (TPX) on Stock Picks on July 1, 2004, when it was trading at $14.45. I do NOT own any shares of TPX nor do I own any options. TPX closed today at $17.00, down $.43 on the day, yet up $2.55 or 17.6% from when I posted the stock about a year ago. First thing to note, TPX is not on the top % gainers list today. This is no small thing. When a stock is on the top % gainers list, it suggest something good happening to the stock, something like an earnings announcement, a news event, or somebody accumulating shares of the company. If TPX were on that list, I might be writing about it again. We can see that this stock actually is breaking through support levels, dropping today and fairly steadily from June, 2005, when it was trading at $24 to its current $17 level. This is not the kind of graph I am looking for. The rest of the TPX story is intact. The latest earnings were strong, the Morningstar.com data looks reasonable and the valuation isn't bad. But I believe that in order to invest in the fashion that I am doing, you need to apply all of the rules, including finding stocks the day that you wish to purchase them that are on the top % gainers list. I hope this discussion isn't discouraging to you! I do think that as you develop a portfolio, and if you are successful it shall be fun. In fact, it could be a GREAT idea to purchase some TPX today, if it goes on to advance to higher prices. It is just that you commented on "my rules" and one of them, a key element, is starting out with the top % gainers!